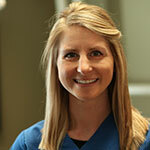 Kadie started with our office in 2012 and is Dr. Brian’s EFDA and assistant. She is happily married with four children who keep her and her husband very busy along with their two Doberman’s. She enjoys running and doing half marathons.